A pneumatic press fed by a servo feeder chops up 1000-lb. spools of 3⁄16-in.-dia. 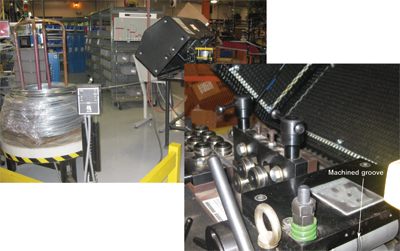 wire rod, the cut length determined by an operator scanning a barcode into the machine control. Two sets of straightening rolls—a seven-roll horizontal set and five-roll vertical set—straighten the wire before it finds the entry end of the press. There, the straightened wire lands in a groove machined into the feed drum to align the wire for blanking. six-sigma initiatives, that visual inventory controls (kanbans) and level-loading that allows for efficient inventory buildup in warm-weather months in anticipation of winter’s high-demand period. It’s also brought inhouse lead-time-sensitive fabricating and manufacturing tasks that the firm deems critical to quality and timeliness. So while assembly is really the primary core competency of the facility, and where R.W. Beckett hangs its hat, the firm has invested in improving a few critical metalforming tasks in recent years, with measurable, quantifiable payback results. While the company does not perform a lot of sheetmetal fabrication, it does make a handful of components it deems as lead-time sensitive. To manufacture air tubes—rolled and spot-welded cylinders 4 to 24 in. tall—the firm operates a coil-fed press that shears to length, pierces holes and notches all in one blanking die. Cold-rolled steel, 16 gauge by 12 in. wide, feeds into a 30-ton mechanical press. Norris describes a recent project to optimize operation of the press line to improve productivity and “mistake-proof” the process. So satisfied with its first barcode scanning to help manage servo-feed setup, Norris and Rodjom soon found another application for the technology. Inside each air tube (described above) mounts a pair of cut lengths of 3⁄16-in.-dia. wire rod, of galvanized cold-rolled steel. These lengths of rod—electrical contacts—traditionally had been purchased components, until the firm’s purchasing manager asked Norris and his team if they could fabricate the lengths of rod inhouse. Newly designed assembly cells at R.W. 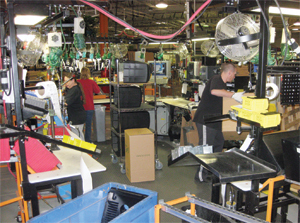 Beckett locate assembly workers in the center, facing out to access parts bins filled by a crew of shoppers, as well as their workstations. There’s no turning and twisting, which has led to a significant gain in productivity. Bringing cut-to-length wire-rod processing inhouse, the company set up a small pneumatic press, fed, again, by a P/A servo feeder. Wire comes in on 1000-lb. spools; two sets of straightening rolls, a seven-roll horizontal set and five-roll vertical set, straighten the wire before it finds the entry end of the press. There, the straightened wire lands in a groove machined into the feed drum to align the wire for blanking. The wire-rod cell has not one operator, but several, as the company employs a crew of “shoppers” to move throughout the facility to collect burner parts into kits, which the shopper then delivers to assembly cells. Each shopper arrives at the wire-rod blanking setup knowing how many burners to include in his kit, and sets up the cell to cut two cut rods per burner. Shoppers use a barcode scanner at the cell to communicate to the servo-feed control the required feed length. With the barcode scanned for the job and the number of parts entered, the shopper can continue shopping and then come back later to pick up his order of blanked rods. The bevy of parts that make up the burners—some purchased and some fabricated inhouse—all eventually wind up at the plant’s assembly area, gutted in 2007 in order to provide efficiency gains. See also: P/A Industries, Inc.